Objective: Identify general tips to prevent the harmful effects of cold weather. Provide the Cold Stress Card from the Occupational Safety and Health Administration (OSHA) website, if possible. Review the information in the module. Ask workers to give signs of harmful effects of cold. Working in a cold environment, outdoors or indoors, can be risky. Cold environments can include low temperatures, high winds, dampness, and cold water. Workers need to pay extra attention to working in cold environments to avoid cold-related injuries. 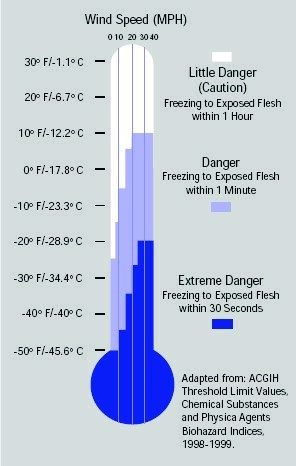 The illustration from OSHA’s Cold Stress Equation (see below) shows the degree of danger based on the temperature and wind speed. Wear adequate, dry clothing to decrease the effects of cold on the body. Do not take drugs like nicotine or caffeine that inhibit the body’s reaction to the cold. Be aware of work environments that could lead to potential cold-induced injuries. Learn the signs of cold-induced injuries and what to do to help workers. Wear proper clothing for cold conditions. Layer clothing to adjust to changing environmental temperatures. Wear a hat and gloves. Also, wear polypropylene underwear to keep water away from the skin. Take frequent short breaks in warm, dry shelters to warm up the body. Avoid fatigue because energy is needed to keep muscles warm. Avoid drinks with alcohol or caffeine such as coffee, tea, or sodas. Drink warm, sweet beverages such as sugar water or sports-type drinks. Eat high-calorie foods such as hot pasta dishes. Workers can lose body heat through convection, conduction, radiation, and sweating. Do not use nicotine, caffeine, or any medication that inhibits the body’s reaction to the cold or impairs judgment.